rocky's bru: Have you paid a bribe today? On twitter this morning, Lim Guan Eng was still ranting about a survey that said Malaysia was the most corrupt nation in the region. Well, there are surveys and there are surveys. The Penang CM won't be quoting from findings of the World Bank's survey below, for example. Nor would he like the latest Transparency International's Global Corruption Barometer 2013. 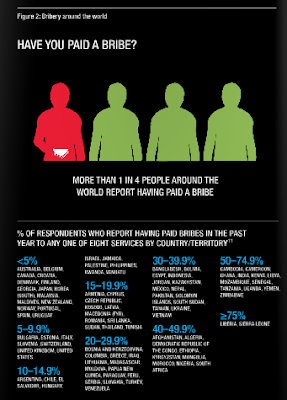 Worldwide, one in four businessmen admitted to having paid bribes to get business, says the survey. The good news is in Malaysia (as in Australia, Japan, South Korea and Norway), only 5% or less of the respondents said they had actually bribed our people in order to get business. I think that kinda gel with the World Bank's report, don't you? Malaysia has achieved a significant surge to 6thposition among 189 economies in the latest World Bank Doing Business 2014. Malaysia has achieved this well-ahead of its target to be among the top 10 by 2015. At 6th position, Malaysia has been placed in the same league as Singapore, Hong Kong, New Zealand, United States and Denmark. This ranking also places Malaysia ahead of economies such as the Republic of Korea, Norway, United Kingdom, Australia and Finland. Soon after Prime Minister Najib Razak assumed office, Malaysia was in 23rd place. The rise to 6th place is testament to his stewardship and a result of the economic and government transformation programmes. Malaysia has achieved 1st position in Getting Credit and 4th in Protecting Investors six years in a row. In the area of Trading Across Borders, Malaysia made a breakthrough to 5th position. Other significant improvements made were in the areas of ‘starting a business’, ‘dealing with construction permits’, ‘enforcing contracts’, ‘resolving insolvency’, and ‘getting electricity’. The World Bank further acknowledges that Malaysia is among the economies that improved the most across three or more doing business areas. Malaysiahas made starting business less costly by reducing the company registration fees while in ‘dealing with construction permits’, the establishment of one-stop centres has facilitated construction processes. Malaysia welcomes the World Bank findings. They are testament to the efforts made by both the public and private sectors to help Malaysia become a high income nation. The Task Force to Facilitate Business(PEMUDAH) has proven to be a platform where the public and private sectors collaborate to create a sense of urgency in improving Government service delivery, enhancing Malaysia’s competitiveness and ensuring business is facilitated efficiently. Since its inception in 2007, Malaysia’s performance in the World Bank Doing Business has improved from 25th position to 6th position. This year is the country’s largest leap in its competitiveness ranking, reinforcingMalaysia’s position as a preferred destination for trade and investments among local and foreign investors. Notwithstanding this significant improvement, the Government is aware that there is no room for complacency. As we move forward, we are seeking to do more,cogniscent of the competition that Malaysia faces both regionally and globally. Our central challenge will lie not only in addressing operational inefficiencies in service delivery but also in reviewing regulations to further reduce the burden of doing business in Malaysia. I got it, the bribe taker should not be blamed. One should stand the principle of not getting things done even if they insist not to pay bribe and let other pays. Bribe=corrupt=abuse.... All has the same meaning and effect. The Book "Chinese Dilemma" by Ye Lin-Sheng has been sold out in both Borders and MPH. Either a rich chinese Tycoon has been buying all available copies so that the masses couldn't, or that the book is so popular, so informative that each copy has been snatched from the shelves. Either way, more prints are coming. So for you all out there --- get your copies fast. This is a good expose on the Kiasu and greedy nature inherent in the Chinese, with the malaysian ones being the most deplorable and and most obnoxious. To know why, read the book. laymen only "pay" $10 to enter Siam but gigantic supermart paid $million to enter the same territory. See the different? Haiyah, 6th oso can, what? Why bother to try for 1st place - too much stress, lah. Lagi, some kurang ajars will be mouthing off about "meritocracy", "competitiveness" and similar neo-liberal shibboleths. Very susah, lah, all this. Apa pasal kita cari 1st place sini, 1st place sana? Itu lain orang punya pasal. I've never paid a bribe nor have cops ever asked for one. Anyway, I've never had a summons or ticket because I follow the rules and park or drive correctly. I've found that all those who rant about corrupt cops, if you ask them why cops stopped them, they will admit breaking traffic laws. Also, when dealing with government departments, speak lah in the national language and be polite. Guarantee it goes a long way. I've seen some nasty malaysians barking in english (broken in most cases) at some lowly clerk whose job is not to pander to their inadequacies. punishment for bribery should be death, or cut the hand. Thats the only way to curb bribery in Malaysia. Dont use singapork or dubai as example, coz salaries for their civil service are high. He should know better, what. He always practice bribe and corruption, one. Tunku Aziz also he wants to bribe. Leng Chai already said it. NB: Now, after Mat Sabu no longer MP, still use State Gomen funds to pay him, ka? Ye Li-Sheng answered all. Berserk, ranting ? The man with a golden gun ? Yeah, right. As if Malaysian business people are going to say they gave a bribe to win deals. I took the trouble to read this report. All of these are beacons of democracy, no? Ye Li-Sheng's book might out-sell Tun's A Doctor in the House. He sure knows what 'topic' sell best in Malaysia, nowadays. But you must be Chinese to write what he had written. Who would have trusted its content, if it was written by a non-Chinese? The Chinese sure have more advantages than the Bumiputeras, in terms of wealth accumulation. Ali Rustam is correct, after-all. It's illegal for the Malay Muslims to engage in Toto, 4 ekor, Casino, Nightclub, pimps, whorehouse, owns a bar, Chetty/Along etc...and of-course, bribery too. Wonder if PAS could make all above 'Halal', when PR get to govern, GE14. They never say anything about Comango's demand what! It always start from the greedy ones who want something that they can't have or don't qualify. They take the short cut to offer bribes that is far too tempting for the ones on the other end and falls for it. The one who offers should be dealt with severely mostly those who are weak in character. Perhaps have to ask UMNO leaders have they received a bribe in the last year from Chinese business men too. To keep them honest. Latuk, you are right. UMNO people don't take bribes. They only award themselves overpriced contracts to the tune of billions. Not the same lah. PAS leadership receive bribe too. Only difference is they call it rezeki from Allah. That's why all the timber and mining land in Kelantan ended up in Taukey Cina hand instead of the rightful owners. Money is like a grease to an engine. It is useful to speed things up. It used to be a culture here, but it seems the practice is fast going downhill. People, especially the simple guy on the street, now refused to receive it,even the simple gifts. They are increasingly aware of corrupt practices. Due to humiliation of being exposed are they're becoming good and pious as they get older. It makes those who sit on piles of capital have to come up with something else to circumvent the system in place. I don't know in places in the higher up, but it feels that people are not that easy to be bought nowadays. Congrats to PM Najib and MACC for the improvement. Let's continue to eradicate this disease from our society. Please pass a law to punish the givers more. Please also pass a law to punish the civil servants for the unexplained wealth. With this two new laws I think Malaysia will be a corrupt free nation in no time! Lookit all the worms, writhing in the heat. Siapa la yang makan cii tu agaknyew. Come now Zheng Ho, you're better than that. I never said Umno people don't take bribes. I never said DAP people don't take bribes, either. This posting is not about Umno people or DAP people at all. It's about how we rank on Transparency International's latest barometer. Now take a deep breath and read my posting again ... slowly this time. I know Malaysians who have migrated to some of these countries. I'm sure they'd feel at home. Well, Bru - I am sure that there are many Malaysians who have migrated to Australia, Canada and New Zealand (just to cherry-pick 3 countries from your list). And I am sure that they are reasonably happy there - cost of living, safety, education system, health care etc. But closer to home, you've left out Singapore. Why? Is it because Singapore is marked higher than Malaysia in the Transparency International rankings? After all, there are hundreds of Malaysians who work in Singapore, who have migrated to Singapore, who study in Singapore and who spend considerable amounts of time in Singapore. Are perceptions of corruption a reason why they continue to do so? Thanks Eri. I think they might have been paid to laugh, actually. And Syed Mokhtar can expect more of the same from Bad For Melayu 89.9. I don't know lah, since Tong bought a stake in the radio station, nothing's the same. Used to like the way they were critical of the establishment. Now it seems there's always udang di sebalik batu. I'm sorry for the remaining honest-to-goodness people at BFM ..